The Cairngorms National Park is the perfect location for biking, mountain biking in Aviemore is very popular due to the terrain being so accessible! 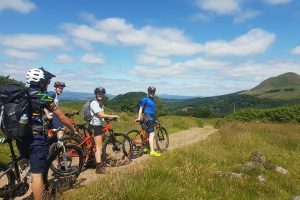 There are trails to suit all abilities; gentle forest trails, fun single track and big mountain days for those looking for a more challenging ride out! Guided Mountain Biking days are tailored to suit your ability. Our guides have vast knowledge on the surrounding trails and will be able to guide you on a route that is to your ability with the option to add in some fun and technical tracks if you wish. All day big mountain routes are also available for those wanting to push their riding. There is nothing better than descending from the big mountain tops on two wheels! The Cairngorms has it all for mountain bikers. Know the area and looking for bike rental? Book you rental online today!